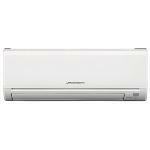 Mitsubishi MSZ-GE25VA / MUZ-GE25VAH Expert Reviews - Read Reviews and Buy Smarter Online. Verdict: Bought one of these for our bedroom in October 2012 and have never had a complaint about the performance and/or running costs. Cooling fan in outside unit has developed noisy bearings, so have put in a warranty claim. Other than this, all is good. Verdict: Brilliant. Does everything you want in an air-conditioner. Quiet as well. And incredibly reliable with temperature control. No complaints whatsoever.